December 8: solo concert / Charity Concert de Bienfaisance, Salle ThÃ©rÃ¨se Casgrain, 4245 Boulevard DÃ©carie, Montreal, Quebec H4A 3K4. December 8: solo concert, Philharmonic Hall in Liege, Belgium. November 18: solo concert, Delemont, Switzerland. November 17: solo concert, Brussels, Belgium. November 12: solo concert, Den Hague, the Netherland. November 11: solo concert, Copenhagen, Denmark. November 10: solo concert, Le Guess Who, Utricht, the Netherlands. July 28 - August 6: Festival of "Midsummer music dream ", Quebec, Canada. September 26, 5pm: solo concert at Norton Museum of Art | Chinese Moon Festival Celebration, WEST PALM BEACH, Florida, USA. Info: http://www.norton.org/moonfestival. August 8: Solo concert at Le Festival OSM Virée classique, Montreal, Salle Claude-Léveillée. July 24 - August 2: Festival of "Midsummer music dream ", Quebec, Canada. April 22-26: Long Island Guitar Festival, New York, USA. September 18-20: solo and collaborations at ¡Globalquerque!, New Mexico, USA. July 26 to August 4: Midsummer Music Dream Music School & Festival. 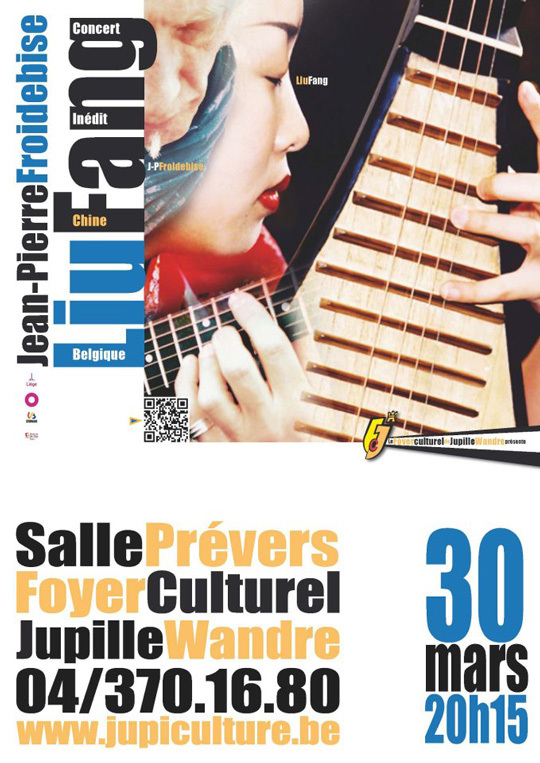 February 7: Liu Fang performed solo pipa at the Book Lover’s Ball in honour of the RIVER OF STARS by Guy Gavriel Kay, the award-winning, internationally bestselling author of 11 fantasy novels.